Baien no Sato is an onsen resort in the remote Kunisaki Peninsula of northern Oita, located on a mountain ridge in the southern part of the peninsula, somewhat north of Kitsuki. As well as a hotel there is also a campsite and comfortable two storey, self catering log houses. The rooms in the hotel are all Japanese-style with tatami and futons, and they all have en-suite toilets. The rooms have great views down into the valley below. The onsen is nice, with large pools and a sauna. The food is seasonal and delicious. I paid 8,800 yen for a room for myself including the delicious evening meal and breakfast. What sets Baien no sato apart from other accomodation in the area is that it has an astronomical observatory with the second largest telescope in Kyushu, and guests have access to it under normal conditions. 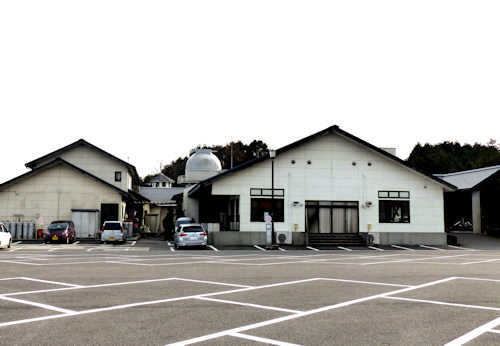 The restaurant, onsen, and telescope are all available for non-residents. The name Baien comes from Baien Miura (1723-1789), a Japanese philosopher of the 18th century who was influenced by western thinking, especially in the area of science. His former home and a museum dedicated to him are located just below the resort. Two buses a day stop at the onsen, and three stop in the valley below, but the whole area is best accessed by private car or hire car.